The Federal Board of Revenue (FBR) announced a reduction in sales tax rates on the import of finished textile and leather products. FBR issued a notification SRO1070 (2017) on Monday and modified the previous notification number SRO1125 (2011). The revised plan applies to the finished products of leather and textile that are ready to be used by the public. As per revised plan, taxes on the import of finished textile and leather goods have been decreased. 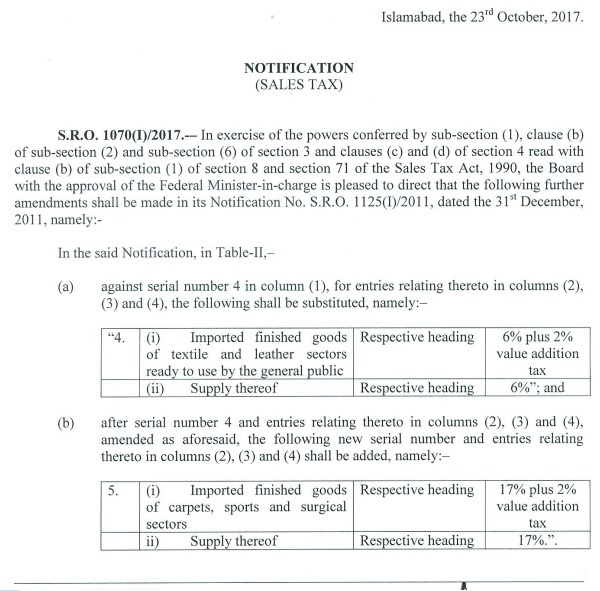 Sales tax on import of these products, as per previous plan, was 17 percent. According to the new plan, it has been reduced to 6 percent. 2% percent value added tax remains unchanged on imported finished goods of textile and leather. New plan sees a decrease of 11 percent sales tax on import of finished leather and textile products which may result in a decrease in the price of products that come under the leather and textile category. Chalen ap ka supply chain management thora ap k kaam to aya inventory management parhi hai ap ne thori bohat ? Han tou wahab ko kia phudu samjha huwa hai sub nay? ap ka matlub hai is ka asar aglay saal hoga, jub Govt. dobara Tax increase kar de gi.